There's no secret that winters here on the Western Slope can see some major snow falls. If you are like us, that's one of the charms of why we like to call Colorado home. However, because bright sunny days often follow winter storms ice damming is a common problem that we see up and down the Roaring Fork valley. 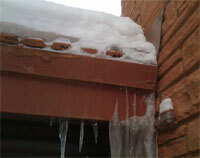 Ice dams form at the edge of a roof as melt-off meets cold air. In a matter of just a few days ice may build up to a couple inches thick, preventing melt-off from getting off the roof. In especially bad situations ice dams can build up to be a foot or more thick! Think of how much water that can hold on your roof. That water can then find its way into your home, damaging interior walls and ceilings...even on new roofs. If you've lived here long enough we are willing to bet that you've been on the receiving end of a section of packed snow falling from a roof. Most of the time its just a bit of winter "fun" but packed snow and more especially falling ice can injure people and damage property. 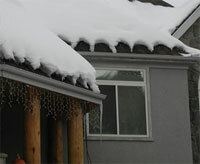 Snow retention system and heat cable can help eliminate all of these problems. While there are very few homes that need solutions to these problems around the entire structure, almost every home can benefit from their wise and judicial use.